Update: Seems this car got a bit of a thrashing on the AlfaBB (thanks Alejandro for pointing me to the thread). There is a lot of (earned) mistrust around the workmanship done to old cars in Mexico, stating of the obvious in the incompleteness and non-originality arena, etc etc- I say, and try to practice, keep the criticism constructive, we’re talking about a cool car that WILL change hands at some point soon. If you don’t like the asking price and ARE an interested party, give the seller a call. If you aren’t an interested party and don’t like the asking price -laugh about it, shake your head or bring it up at your next car club meeting, but avoid public disparaging. I’ve written about the sale of several. Regarding cars out of Mexico -I think it bears looking at them each as individuals. Is it really any different than the variety of repairs you see on older driver cars coming on the market anywhere else? I’ve seen lots of funky seats in Spiders right here in the US of A. Scott, I think it’s time for more/better pictures, a very well considered and researched eBay listing -I’ll help if you want. Giulietta Spider 750D 1495*00073, 1315*46822 (not original). Scott sent me some questions about this car yesterday and I ended up agreeing to list it for him here. 00073, an early 1956 built car, is one of the earlier chassis numbers I’ve listed (I think 00007 and 00033 are the only earlier ones) so if you’re into having an early chassis number, this might be for you. 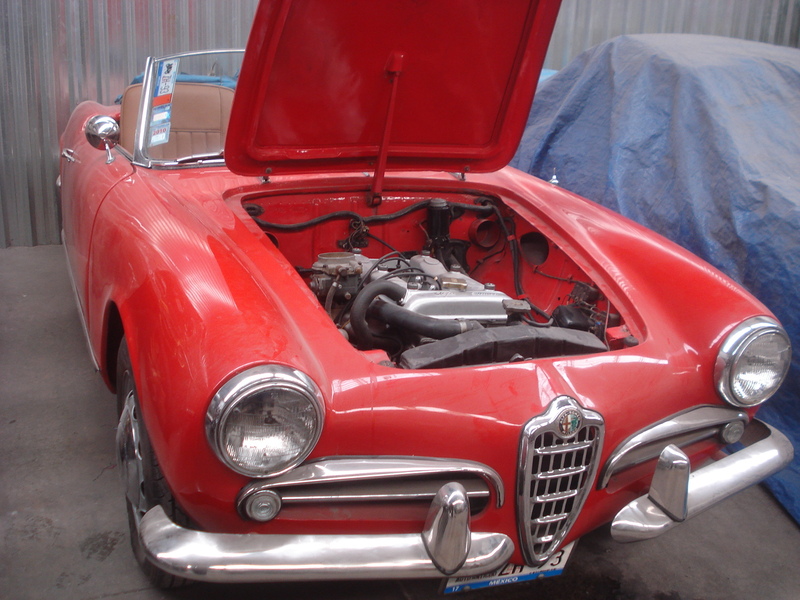 Car came out of Mexico and has the typical for that area incorrect repairs done with an eye toward keeping it on the road over the dark ages of Giulietta parts availability. It doesn’t appear to be rusty, but only thorough pictures, or inspection in person will say whether or not it is or has had any repairs. Car has been stored for a few years, last driving in 2008 or 9. Asking price is now $21,999. If it really is as rust free as it appears, and can easily be made to run, this is a good deal, since the only work you need to do is swapping out incorrect parts, or refinishing stuff, as it suits you, while you drive it. If you’re interested, email me at sprints @ giuliettas.com and I’ll put you in touch with the owner. Car is in Laredo Texas. The first impression of the body is good. Door fits very well, the nose and trim all look to fit well too. Those bumpers look weird to me; over riders are too tall and the bumpers extend farther around the car than I am used to. Maybe an early car thing, may be something else.